Mormon Wookiee: #7: Part 1: My favorite Mormon iPhone apps. Last year, the company that I work for got me an iPhone. I had never had a smartphone before (although I once knew a kid who had a Mickey Mouse phone that would talk to you. I thought that was a pretty smart phone). As a video game lover, I was extremely excited about some of the games I had heard about on the iPhone, such as Plants vs. Zombies ("Braaaaaaiiiiiins! "), Paper Toss (tossing paper in a garbage can....but on a phone! ), and Angry Nerds (or whatever that game is called). Naturally, I bought these games immediately, and for a time, I became an iPhone gaming appoholic. I had some very good times with my electronic friends named Tower Defense, Swords n' Soldiers, Jetpack Joyride, and of course, Infinity Blade (just one more fight and then I'll stop playing!). Although I still love playing an iPhone game for a half an hour now and then, I have mostly recovered from my appoholicness. Indeed, I actually deleted most of my iPhone games because Elder Ian S. Arden's General Conference talk (found at http://lds.org/general-conference/2011/10/a-time-to-prepare?lang=eng) helped me remember that there were better ways to spend my time (like blogging about Mormons and Wookiees, for example). Even though I deleted many of my gaming apps, there are some other apps that I absolutely love and use on a daily basis. Some of these apps are Mormonism related. In case you are interested, see the list of my favorite Mormon-related apps below (in order of awesomeness, of course). 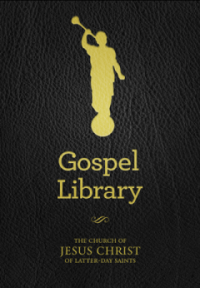 #1 Most Awesome Mormon-related App: LDS Gospel Library. This app is INCREDIBLE. Not just regular incredible, but lightsaber level incredible. It contains the entire LDS scripture canon (Old Testament, New Testament, Book of Mormon, Doctrine & Covenants, and Pearl of Great Price), every General Conference talk back to 1974 (my dad was still in high school), every Church magazine back to 1971 (my dad wasn't even in high school yet), the Hymns and Children's Song Book (gotta love "Give Said the Little Stream"), and much more. And the best part? It's free. Not $14.99. Not $9.99. Not even $3.57. FREE. #2 Most Awesome Mormon-related App: BYU Citation Index. This app is also incredible. It contains every General Conference talk and every Journal of Discourses sermon clear back to the early days of the Church. However, simply containing the talks is not the best part of the app. What the app REALLY does is so much more. 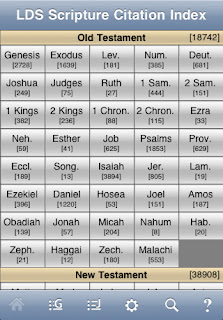 The main page starts with a list of the various books of scripture (see picture below) in the standard works. If you click on one of the books (to make things simple, let's pick everyone's favorite book, Zephaniah), it will then show you a list of chapters. If you click on one of the chapters, it will then show you a list of verses. If you click on a particular verse, it will then show you EVERY SINGLE TALK that has mentioned that verse!!! You can then click on the talk and read the full context. Oh, and it's free too. Boo-yah! Right now I am studying Matthew 5, which happens to have 1,009 talks written about it. So far I have read the first 7 (only 1,002 to go!). If you really want to use the Citation Index to its fullest, check out the even more robust online version for your PC or Mac at http://scriptures.byu.edu/. 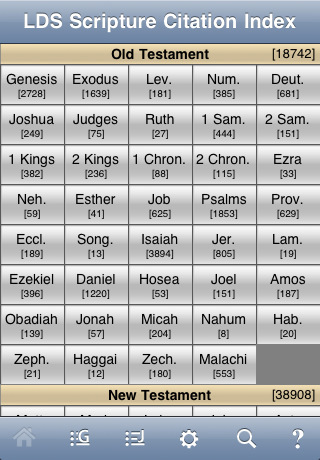 This version provides everything on the app, but IN ADDITION it allows you to search by speaker to see which scripture they reference the most frequently. For example, did you know that President Monson's most frequently cited verse is 1Timothy 4:12? He has referenced "Let no man despise thy youth; but be thou an example of the believers, in word, in conversation, in charity, in spirit, in faith, in purity” twenty different times! It is very interesting to see what verse a particular speaker references the most. You should check out President Hinckley and Joseph Smith—their citations are pretty similar. I will post Part 2 of my very most favoritestest Mormon-related iPhone apps tomorrow. Until then, gwraaaaaaar! ("See you later" in Wookieesh). I have the Gospel Library, definitely one of my most used apps, but I didn't know about the citation index, I'm going to have to download it and try it out. I didn't know about the citation index either! I'm gonna have to download is ASAP. To find President Monson's most cited verse did you go through the whole list on the side or is there a way to search for that? Excellent question, Joe. To find a particular speaker's citations, click on the cog next to the hourglass on the left side of the screen. Then filter by speaker, and then sort by citation frequency. Voila!